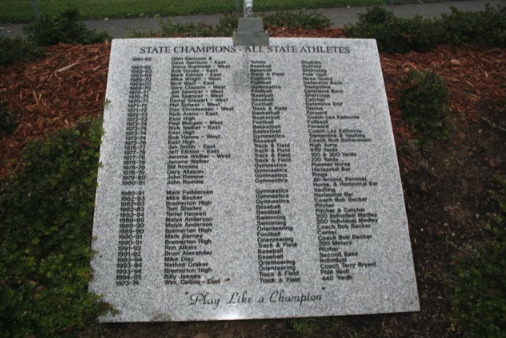 In the fall of 2002 the park was completed and dedicated by former players, coaches and friends of the Former Coach. It's important to remember that the park is more than just about athletics, it's about history, good times and giving back to the community. Click here to order personalized tiles by mail! 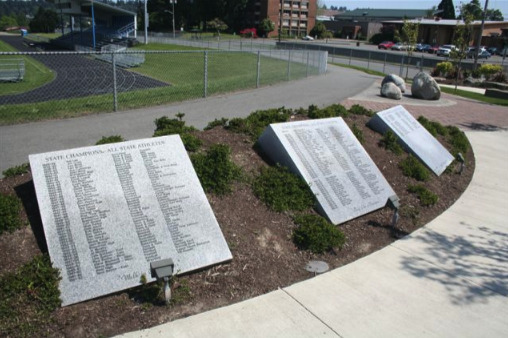 The Bremerton High School Associated Student Body of 1946-47 raised the money to build a fitting memorial for the veterans of the World Wars. They named it Memorial Stadium for the many classmates, friends, neighbors, and family in this community who gave life, limb, and soul for freedom during the great conflicts. Hundreds of thousands of people have entered Memorial Stadium not realizing how much the construction of this arena has meant to the Kitsap community. Only the 1,406 Bremerton High students who raised $39,562.00 to build the stadium truly appreciated its worth. This is one of the very first and largest memorials in an area steeped in military history. 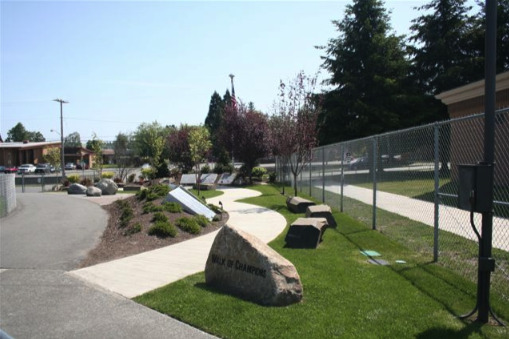 In 2007 the Semancik Foundation expanded the project started sixty years ago by creating a personalized veterans’ memorial and flag plaza in Bremerton’s Memorial Stadium called "The Path of Freedom." There is no other veterans’ memorial like this on a high school campus in the Northwest. The Path of Freedom was dedicated on November 3, 2007. 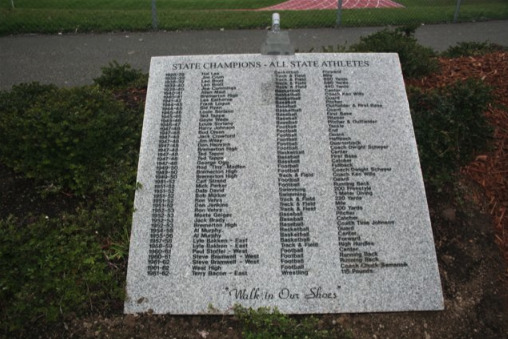 The park, tucked into the southeast corner of the stadium, is unique in that the names of all those in Kitsap County who made the supreme sacrifice are engraved on three 2,000 lb. granite slabs in the flag plaza. At the time of the dedication there were 438 Kitsap military from WWI to present who had been killed in action. 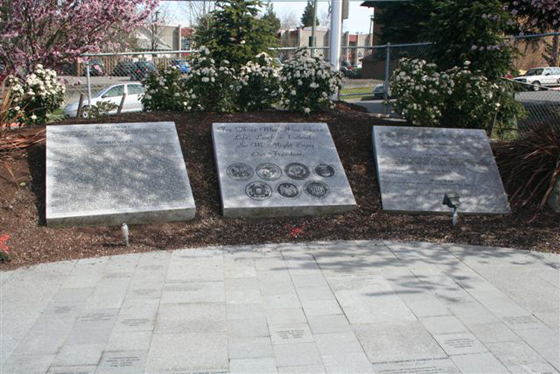 The center slab is inscribed with the logos of the seven branches of our military and the theme of the Path of Freedom. "For those who have given life, limb and soul, so we might enjoy our freedom." In addition to the fallen heroes' inscriptions, commemorative walking-tiles are offered to the public for personal remembrances within the park area. Among these, one will discover tiles engraved in memory of the eleven Congressional Medal of Honor recipients who have had residence in the Kitsap area. 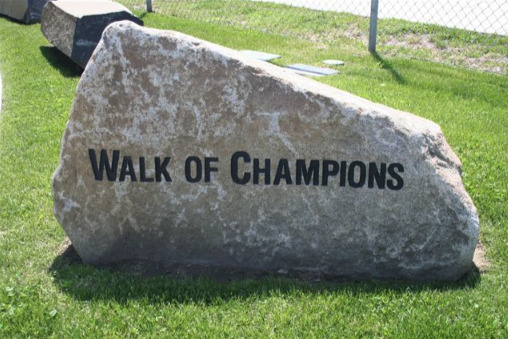 A special section is reserved along the pathway for a number of local businesses and citizens which span the county. These good Samaritans gave countless hours, resource, and materials to make a dream come true. We call them our Kitsap Community Honor Guard. A flag flown over our nation’s capital on Veterans Day 2005 is visible day or night in the well-lighted, beautifully landscaped park. 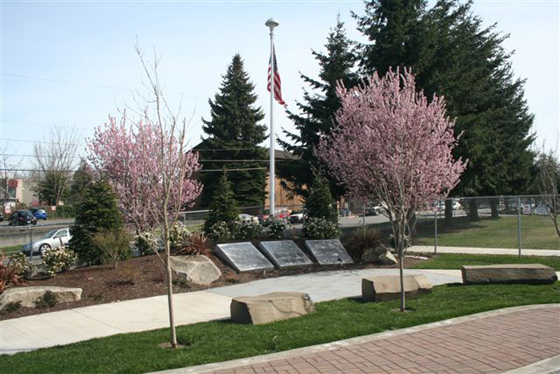 To visit in spring is to witness the rebirth of the colorful foliage which frames this Kitsap veterans' memorial. For so many reasons, the Kitsap County area has been a focal point in the deeply rooted military history of our Puget Sound region. Our organization, named in memory of legendary teacher/coach Chuck Semancik, a WWII veteran (USN), sought to preserve the memories of this rich history. The memorial is a source of veteran/community pride with a place to commemorate those who gave their lives, limbs and souls in the interest of our freedom. The Chuck Semancik Memorial Foundation is a 501c3 tax deductible non-profit corporation under the provisions of the WA Non-Profit Corporation Act (RCW 24.03). This grass-roots organization was established in 2000 and nourished by alumni, athletes, coaches, & friends all sharing to create opportunities for our youth. Donated monies go toward Bremerton High School scholarships and approved community projects. Board members include Ken Aries, Mark Bergsma, Deanna Dowell, Lane Dowell, Chuck Huhta, Bob Izzi, Pat Laney, Marilyn McClelland, Bryan McConaughy, Mike McKnight, Marty Neyman, Ryan Nickels, Chuck Stark, and Congressman Norm Dicks as an Honorary Board Member. No member of the Board or volunteer of the foundation is salaried. Our legal service, CPA, & financial planning are all pro-bono. 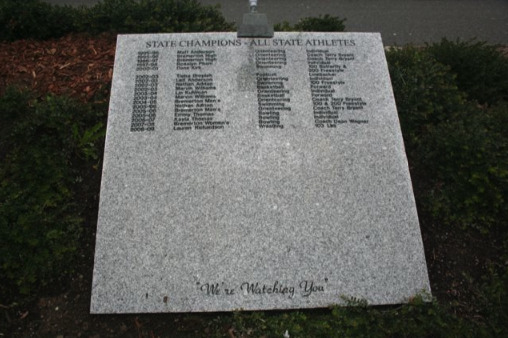 www.semancik.org or PO Box 2723 Bremerton WA 98310-0351 Become a Part of Kitsap County History Leave a piece of YOUR HISTORY at BREMERTON MEMORIAL STADIUM by purchasing a personalized brick in the veterans' memorial at Memorial Stadium's PATH OF FREEDOM. Your bricks will make great memories for families, memorials, businesses, and the entire Kitsap community.